Vyncs is a Real-Time GPS tracking system. That means data comes to your account in real-time as the vehicle is driven. You can browse the information using your desktop computer or Android/iOS phones (from any wireless carrier such as AT&T, T-Mobile, Verizon, Sprint in United States). The Vyncs Link OBD-II device however makes use of AT&T wireless network with a fall back on T-Mobile. The device comes with a built-in SIM card and a data plan for one year. 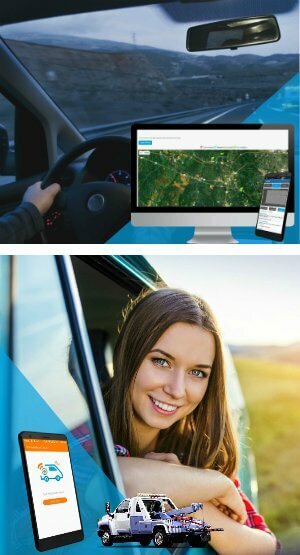 Vyncs: Our standard 3G real-time GPS tracker product for consumers. Vyncs Premium: Standard Vyncs along with one year roadside services (available only in USA, Canada, and Puerto Rico). Vyncs Pro: Vyncs with 60 seconds GPS update and Live Map Auto Refresh (map automatically refreshing as new GPS data comes in). Vyncs Fleet: It is the fleet version of Vyncs with many features for commercial fleets including support for more than 5 vehicles in an account. Vyncs Miles: Automatically keeps track of your miles using just the smartphone app with the best phone power consumption performance in the market. Does not need any OBD-II device like Vyncs. Zone Alerts: You can also set up Geo zones from the Vyncs web account or smartphone apps for getting departure/arrival notifications. Zone alert report for drivers (in Vyncs Fleet). Street Addresses: Reverse geo-coded address on the map. Addresses on the trip table with downloadable data in Excel readable format (in Vyncs Fleet only). GPS Locations: Location by day, location by trip, last known location view. Live map automatically refreshes the map as the new GPS data comes in with Live Map Auto Refresh Update. Vyncs Link Device: Dimension: 0.9 x 1.7 x 2.6 inches; Weight: 2.2 ounces. Device does not need a battery. Draws power from the OBD-II port of the car. Goes to sleep after the vehicle ignition is turned off but wakes up once in every hour to report the GPS location to your account and then goes back to sleep again. Where Does Vyncs Work? Vyncs Link device comes with a built-in SIM card that currently works in 181 different countries including USA, Canada, Puerto Rico, and Mexico. Here is the complete list of supported countries: Austria, Belgium, Brazil, Bulgaria, Croatia, Cyprus, Czech Republic, Denmark, Faroe Islands, Finland, France, Germany, Greece, Hungary, India, Ireland, Italy, Latvia, Lithuania, Luxembourg, Malta, Mexico, Netherlands, Poland, Portugal, Puerto Rico, Romania, Saudi Arabia, Singapore, Slovakia, Slovenia, Spain, Sweden, United Kingdom, and USA. However, before you use Vyncs in a country please make sure that it is allowed by the local law and you abide by all legal requirements. 1. Alerts: Driver alerts for unsafe driving such as speeding (above the threshold you set), rapid acceleration, harsh braking, rough cornering. 2. High-G Events: Vyncs device has a dedicated accelerometer chip for detecting rapid acceleration and braking events. The events are reported on a map showing the locations where the events took place. 3. Device Tampering: An alert is generated once the device is plugged back into the OBD-II port after it is removed. The device does not have a battery for safety reasons. 4. Speeding Histogram: This visualization allows you to see how much time the driver spends in different speed zones. 5. Driver Score & Trip Performance Index: Each trip is evaluated from the safety perspective and assigned a Trip Performance Index (TPI). The TPI from multiple trips are appropriately combined to generate the long term Driver Score. 6. 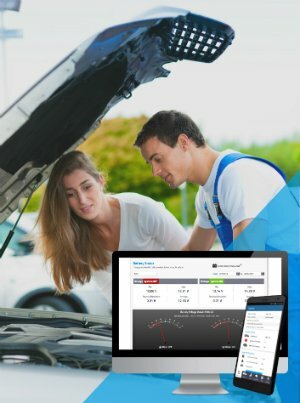 Roadside Services: Free roadside services in US, Canada, and Puerto Rico with Vyncs Premium. You can also purchase upgrades for Roadside services from your standard Vyncs account. Includes 24/7 roadside assistance, free towing, winching, lost key/lock-out services, fuel delivery services, and many more. 7. Idling Map: Shows idling events on a map. Supported only in Vyncs Fleet. 1. Fault Codes: Vyncs Link device collects vehicle diagnostic trouble code data (restricted to the data that the vehicle manufacturers make publicly available through the OBD-II port). The trouble codes are reported to your account. Check engine lights and emission information are reported whenever available. 2. Maintenance Reminders: Vyncs provides regular vehicle maintenance reminders. VyncsFleet allows keeping track of maintenance records and creating custom maintenance tasks. 3. Battery Health: Vyncs reports battery health condition. 4. Recall: Vyncs also notifies about the recall notices issued by the vehicle manufacturers. 5. Fuel Cost Tracking: Supported in VyncsFleet. 6. Fuel Level Reporting: Vyncs supports this as long as the vehicle reports this data through the OBD-II port through the open protocols. 7. Personalized Fuel Saving Tips: Vyncs correlates fuel consumption with driving behavior and reports the aspects of one's driving that is contributing towards increased fuel consumption. 2. Allows unlimited number of vehicles per account. 3. Street address on trip table. 4. Downloadable data in Excel-friendly format. 6. Creating custom maintenance tasks. 7. More scalable software and powerful infrastructure for fleets. 8. Stop time reporting on the map. 9. True idle time (vehicle not moving but engine running) reporting on the map. 10. Multiple sub-fleets with more than one managers and due access control. Automatically tracks mileage and creates trip logs. No OBD-II device needed. Great for tax deductions. Free 40 trips per month. Just download the app on your Android or iOS phone. 1. 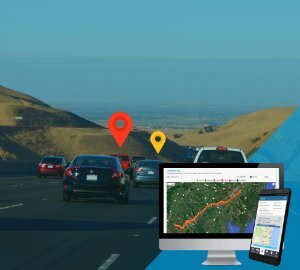 Detects trips and creates mileage logs automatically. Generate IRS guidelines compliant business expense reports that you can download. 2. Awesome battery power consumption. 3. Roadside assistance in US, Canada, and Puerto Rico. 4. Smart-classifies your trips by training the system to learn the category of your trips and automatically classify the trips. 5. Categorize business and personal drives with single touch on the app or smart watches or using Alexa voice-powered technology. 6. Categorize trips in business, personal, charity or any other custom category. 7. Consider tax deductions using VyncsMiles mileage tracking.